The first step in using computer aided design (CAD) software requires a solid foundation of the user interface, commands and features of the CAD software. This intensive, hands-on course prepares the student with the knowledge and skills necessary for creating a basic 2D working drawing using AutoCAD. Topics include CAD concepts, file management, the viewing, drawing, and editing of drawings as well the placement of text and dimensions onto a drawing layout in preparation for plotting. Familiarity with Microsoft Windows and basic drafting knowledge. $736.73 - $743.87 See individual course offerings below for actual costs. BCIT reserves the right to cancel courses. In the event of a part-time studies course cancellation, you will be notified at least two business days prior to the course start. Please ensure that your contact information is current. One seat remaining as of Apr 19, 2019 4:05 am PDT. Seats remaining may change at any time prior to registration and payment. This course runs over two weekends - Friday evenings and all day Saturday/Sunday sessions. BCIT reserves the right to cancel courses. In the event of a part-time studies course cancellation, you will be notified at least two business days prior to the course start. Please ensure that your contact information is current. Please purchase the required textbook prior to the first class as the BCIT Bookstore is not open on Saturdays - www.bcit.ca/bookstore/ BCIT reserves the right to cancel courses. In the event of a part-time studies course cancellation, you will be notified at least two business days prior to the course start. Please ensure that your contact information is current. Use the AutoCAD interface to access commands and files. Discuss the importance of file management when using CAD software. Access the on-line help system and user documentation. Setup drawings and establish initial drawing settings. Change the drawing display using View commands. Use layers effectively to manage object properties. Create a new drawing using a template file. Create 2D drawings using the Draw commands. Edit drawings with the Modify commands. Use effective CAD construction techniques to ensure data accuracy and integrity. Use Inquiry tools to verify accuracy of CAD constructions. Define text styles and create text to accepted standards. Layout a single viewport drawing using a standard scale. Place basic dimensions using annotative scale. Insert blocks to place complex objects as a single entity. Print or plot a 2D drawing. 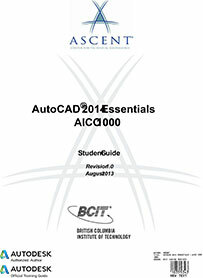 Interested in being notified about future offerings of AICO 1000 - AutoCAD 1? If so, fill out the information below and we'll notify you by email when courses for each new term are displayed here.